~ After all of the snow we got, I thought for sure we'd be out of school today, but....no. A 2 hour delay. Maybe if we hadn't taken a whole day on Wednesday when nothing happened until that night, we'd be off. Can't wait to see how many kids actually show up. ~ I like Fridays. It's the day when I only have 1 group...I see a few kids individually that day, and I have time to plan, catch up on paperwork, and eval kids (if needed). ~ Has anybody seen the previews for "Resurrection"? And "Mindgames"? They look interesting. I'm ready for "Suits", "Revenge", and "Scandal" to come back on. ~ I had planned to get some materials ready over the couple of snow days, but I didn't. I guess I'll be doing some of that over the weekend. Oh, sweet memories of childhood! Except we weren't allowed to go sledding on this hill; we had to go on the hill directly across from the house. This hill is in the same park, just on the other side of our snow hill. ~And, now, since I'm from the South and this is what we do when it snows, I'm going to bore you with snow pictures! Just in case you can't tell, it's a snow person with his legs crossed. Yes, I have my Christmas flags still up...don't judge! I figured it has a snowman on it, and who can see the holly in his hat? 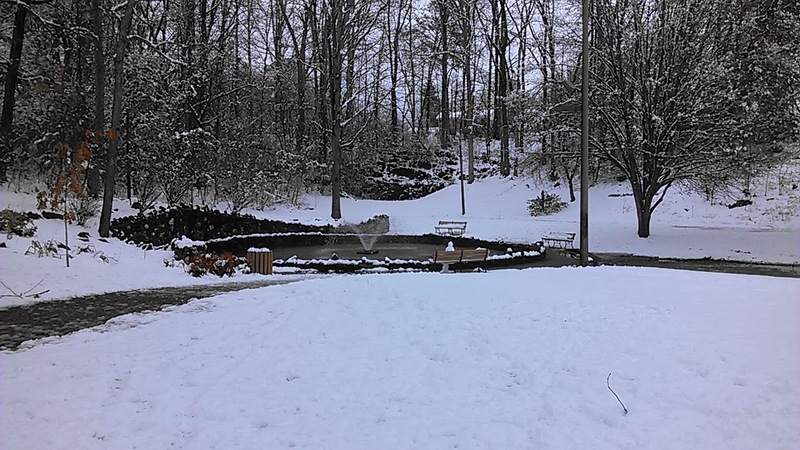 Yep, it works for January! 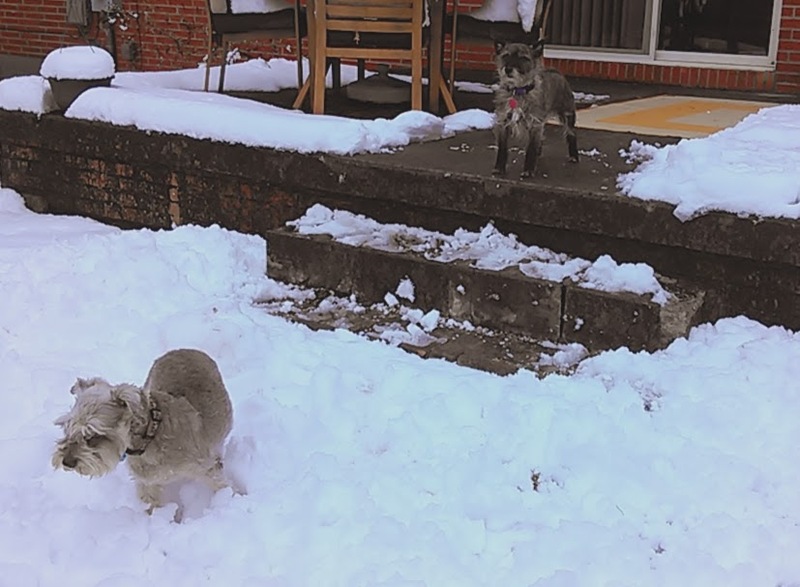 I'm fairly certain this will be Ally's (the schnauzer) last winter. She'll be 15 in April. ~ Because of the snow (and because our director lives about an hour away), we had flute choir a couple of hours earlier than usual, which means I got home right at suppertime. Luckily, YS didn't have to work, so he fixed the dinner I had planned. ~ If you have a long weekend, make it a good one! 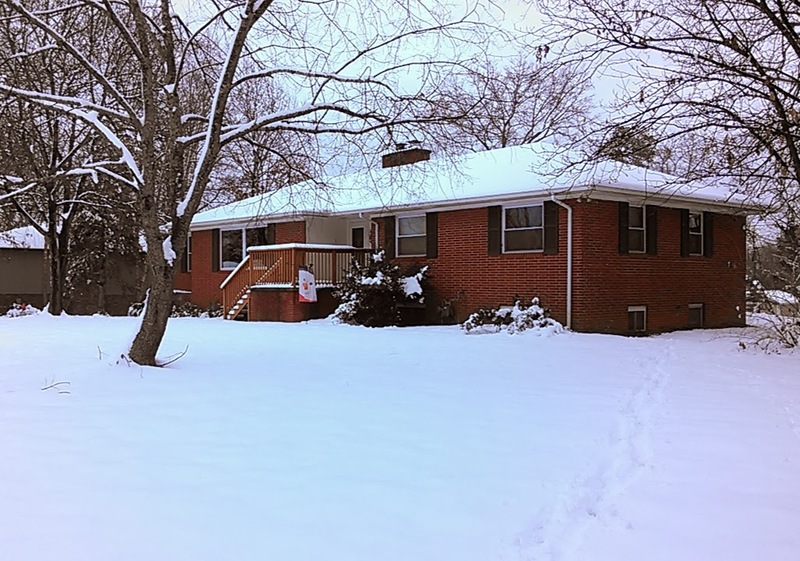 Well, at my age, you can have all the snow thank you very much. 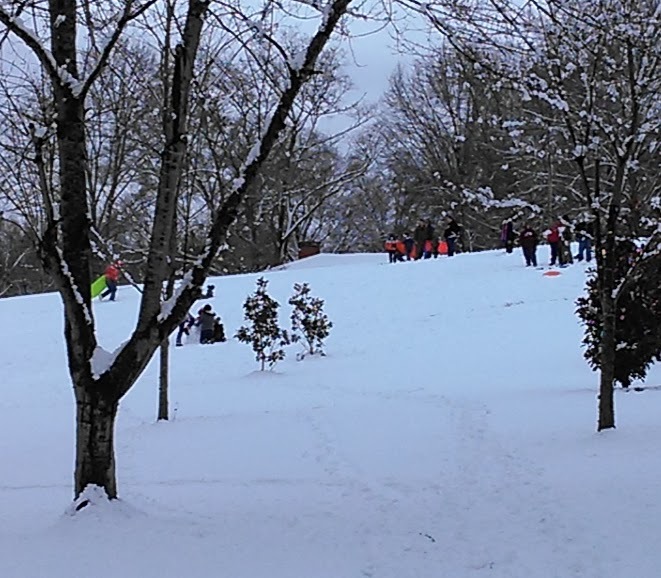 But oh....the youth of snow days and sledding and having fun. Great memories. 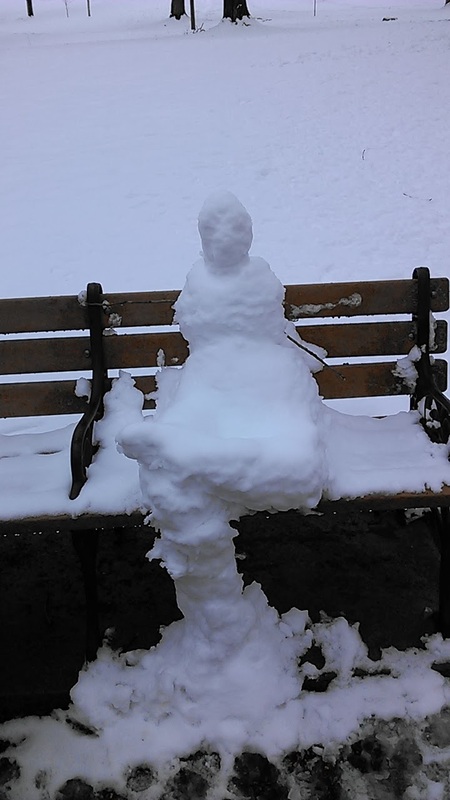 Love the snow person on the bench!! My winter is certainly with you. We here in the UK are swimming in the horrendous rain and gale force winds. My Name is Yvonne Lewis and am one of Arlee Bird's Ambassadors for the A to Z Challenge, I noticed you are signed up to do the challenge , yes, I know it's only February but the weeks fly by. I look forward to visiti you during the challenge and wish you good luck. I can't wait for Revenge either. I can't WAIT for Revenge & Scandal ... & Grey's Anatomy! I love your snow pictures...they aren't boring! Cute dogs too. That Laika is good! Resurrection looks good to me, too. I've recorded every episode of this season's Revenge, but haven't watched any of them, yet. Loved the 'snow person'! How unique! The good new about no snow day is no make up day, either, right? I won't judge - we still have our Christmas decorations up outside. It's too cold and there's too much snow to take them down. My dogs will pee on the deck too when we get snow or it's too cold for their little feet. Have a great weekend! I love all the snow pics but then again, I am a Southern girl too. I would have loved to sled down a hill like that -- I still haven't at age 42! It's tough when our beloved animals get old. My best to you. I'm certain we've had the most snow/cold days ever this year, so far, and I expect another one on Monday. The dogs--We've had to plow some paths in the yard for them, but sometimes they just go on the deck.Last year, Steve continued to poop on the deck ong into summer--Kind of annoying, but I'm not going to walk him out to the woods in the middle of winter, ya know? Thanks for linking up! :) Have a great weekend. The snow person is so clever and cute; love it. I love that snow person on the bench!